Accuracy in casting and versatility in difficult conditions are the hallmarks of the brook fly fisherman. The right sort of tackle can increase your expertise and increase your catch. Fly fishing in brooks and small rivers places a premium on accurate casting at short range. This is the basis of all brook fishing, but when selecting your rod it is important to take into consideration the differences between brooks. A brook running over flat country, or, if on hilly ground, with low banks, can be fished best with a short flexible rod. The shorter the rod (within reason) the more line will be in the air when casting, flexing the rod better and producing greater casting accuracy. A good choice would be a QV-I-lViik rod, designed to carry a No 4 or No 5 line. This is the kind of rod usually recommended for fishing small rivers and brooks, but on water with either high, steep banks, or trees and bushes that impede the back-cast it may impose a severe handicap. In such circumstances it may be preferable to use a much longer rod of 9ft or so, to keep the back-cast above the obstructions, or, if it is flexible as it ought to be, to permit easy, accurate casting where no back-cast is possible, however high the line is thrown. Matters are sometimes complicated by the fact that quite small brooks, capable of naturally producing trout of only modest size, are nowadays stocked with much bigger fish. No great problem exists if the banks are clear and the stream is relatively free from obstructions, but if there are bridges, culverts and bankside trees or bushes which prevent the angler from following a hooked fish up and down the stream, then stronger tackle will be necessary. This tackle includes a more powerful rod, which, in conjunction with a strong leader, allows the angler to put more pressure on a big fish, stopping it before it goes through a culvert, or too far past a bankside tree, beyond which the angler can-not follow. This poses a problem; the powerful rod is less able to throw an accurate short line. Some compromise is necessary. This involves using a heavier fly line than would normally be chosen to fish a small water in order to flex the more powerful rod, and also choosing a rod in a material that is more tolerant of underloading. Split cane and carbonfibre fall into this category, glassfibre does not. Some small streams run through tunnels of trees and can only be fished by wading, using a very short rod. In this situation it is best to use the top section of a 9ft split cane rod plugged into a separate handle, making a rod with a total length of about 15ft. Other brooks are so narrow that, except in a few places, casting is impossible and all the angler can do is to lower a fly straight down or, if he uses a leaded pattern, swing it like a pendulum to the place where he wants it to drop. Paradoxically, this calls for quite a long rod, 9ft at least, and preferably longer still, to allow the angler to keep well back from the water and avoid scaring the trout. In such waters it is necessary to use quite a short leader, often as short as 3-4ft, otherwise the weight of the fly line will pull the fly up to the tip ring of the rod directly it is released. In places where the brook widens sufficiently for proper casting to be possible, the leader can be length-ened to the usual 6-7½ft. On a stream with very dense bushes, where fishing is only possible by poking the rod through branches and lowering the fly, the only answer is to use the longer rod and a level nylon monofilament leader approximately twice as long as the rod. This allows a leader fly to be drawn up to within lAin of the tip ring while the rod is pushed through the bran-ches, and the nylon is paid out, thus allowing the fly to fall into the water. Before embarking upon this pro-cedure, it is sensible to decide how a fish is to be landed if one is hooked. If it is small enough, it can be hauled up to the tip ring, but if it is too big for that, a landing net will be necessary and unless it can be worked through the jungle to where the trout can be netted, the whole operation is impossible to bring to a satisfactory conclusion. Whatever kind of brook one in-tends to fish, it will almost certainly include at least some parts where, for one reason or another, a normal overhead cast cannot be made. The chosen rod should therefore be capable of roll-casting easily and accurately. If it will not, it will prove a handicap to some extent on almost every water, and on some it will be almost useless. It takes time and practice to ob- tain the best results from any rod. 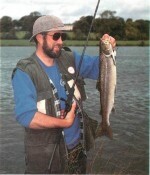 The fly fisherman whose experience has been confined to reservoirs, lakes and larger rivers where long casting is necessary, should practise with his brook tackle until he can roll-cast, throw a very high back-cast into a convenient gap and pull out a forward cast at an angle to it, and even cast a line with a curve in it to put a fly round a corner. When fishing small streams, the rod will often be nearer to the fish than in any other kind of fly fishing, so it is as well to avoid white or yellowish rods, and to remove the shine from others, either by rubbing the high-gloss varnish down with oil and pumice powder or applying an extra coat of matt varnish. To sum up, there is no ideal rod for every sort of brook. You have to pick one, or perhaps more, to suit the water or waters you intend to fish. Do not make the mistake of thinking that cheap, poor-quality tackle is suitable for little waters. In fact, these are more demanding of quality and above all, versatility, than any other trout water.